DR. BASSLEER BIOFISH FOOD PROFESSIONAL CARE and DR. BASSLEER BIOFISH FOOD PROFESSIONAL TREAT are complete premium foods intended specifically for the commercial breeding and farming of ornamental fish. The ingredients are tailored precisely to commercial aquaculture conditions for the rearing of ornamental fish. It is ridiculous to try to save money by feeding low budget food. Stop feeding poor quality to your fish! Feeding high quality DR. BASSLEER BIOFISH FOOD PROFESSIONAL CARE and DR. BASSLEER BIOFISH FOOD PROFESSIONAL TREAT will pay for itself. Strong and healthy fish will save costs for medications and losses of fish. Less complaints of your customers will increase your profit. If you take in relation the value of fish to the costs for DR. BASSLEER BIOFISH FOOD PROFESSIONAL CARE or DR. BASSLEER BIOFISH FOOD PROFESSIONAL TREAT, your daily investment for feeding this premium food will be less than 0.0001 %! Your savings will be much more! DR. BASSLEER BIOFISH FOOD PROFESSIONAL CARE contains natural immune function boosters, such as Brazilian Açai berries, glucan, algae extracts, citrus pulp, and the freshwater algae Chlorella. It is rich in carotenoids, antioxidants, vitamins and minerals. DR. BASSLEER BIOFISH FOOD PROFESSIONAL CARE guarantees successful breeding, prepares the fish for transportation, and aids their acclimatization during quarantine. 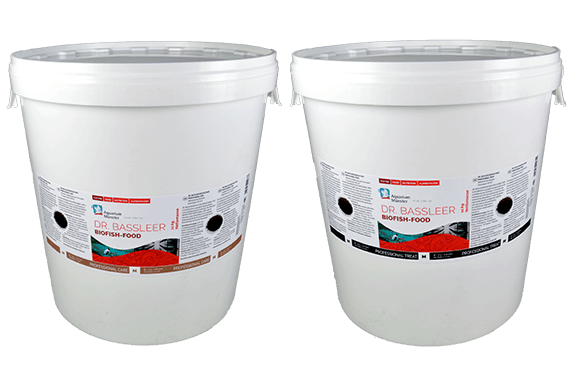 DR. BASSLEER BIOFISH FOOD PROFESIONAL TREAT aids the recovery of ornamental fish during and after medical treatment. The product contains fresh garlic, which is rich in allicin and manganese, and the added value of peppermint, thyme, mugwort and chickweed. These herbs strengthen the defenses and power of resistance of the ornamental fish and therefore help to keep the fish healthy. Emaciated fish quickly regain weight.